Lelei Peau was honored during the 31st U.S. Coral Reef Task Force Meeting in Washington DC with a Task Force award that recognized his outstanding contributions to coral reef protection and management. 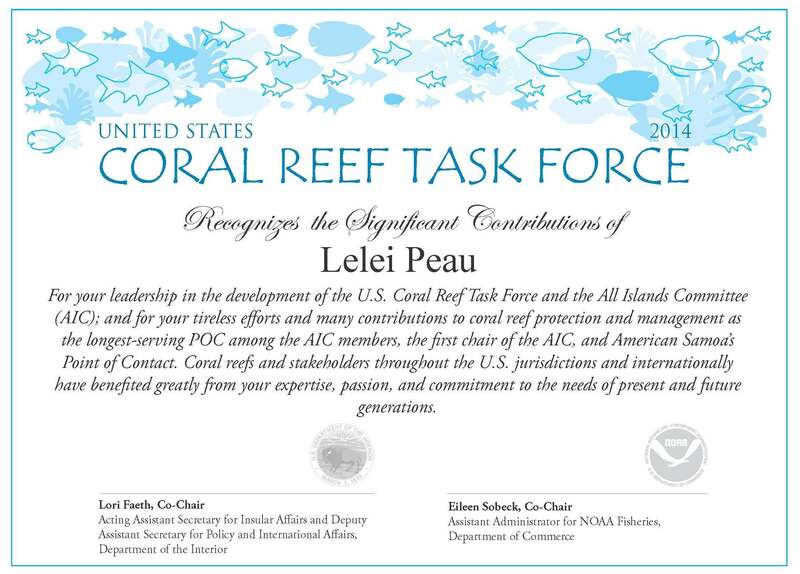 Lelei was instrumental in the development of the U.S. Coral Reef Task Force and the U.S. All Islands Coral Reef Committee (AIC). In 1998, he was present at the signing of Presidential Executive Order 13089, which established the U.S. Coral Reef Task Force and provided key leadership in getting recognition and membership for the Governors of the seven States, Territories, and Commonwealths that make up the AIC. Lelei served as the first Chair of the AIC and continued in that key leadership role for 10 years. He then served 2 terms as the Vice Chair. Lelei was the first Governor-appointed point of contact (POC) for American Samoa, a position he maintained through 2012, making him the longest-serving POC among AIC members past and present. In that role, he provided key guidance and advice to two of the most engaged Governors on the Task Force, Governors Sunia and Togiola, and led the drafting of numerous resolutions, including those focused on climate change. Many of the Task Force’s efforts, policies, and accomplishments can be followed back to Lelei’s input, guidance, and leadership. It is fair to say that coral reefs and stakeholders throughout the U.S. jurisdictions and internationally have benefited greatly from Lelei’s expertise, passion, and commitment to the needs of present and future generations. The AIC extends its heartfelt congratulations to Lelei Peau, for this well-deserved award.